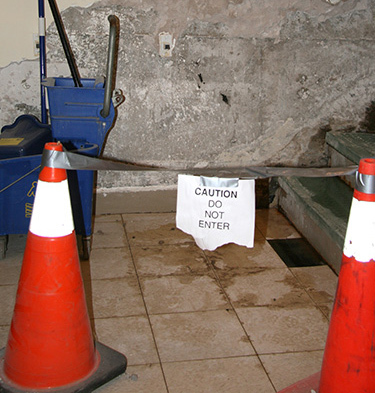 Another pool of water has formed at the bottom of the stairwell in the King’s College Arts and Administration Building(A&A). The puddle first re-appeared last Friday after two days of heavy rain, and it still isn’t drying up. This persistent leak has become a safety issue, which the college can’t afford to ignore. The repairs could cost between $10,000 and $20,000. King’s College interim director of maintenance Gerald Wilson has been trying to track the source of the leak and says if you’ve been a student at King’s for the past seven or eight years, you’d have noticed the water damage in the stairwell. Wilson says maintenance knew of the leak, but needed to find where the leak was originating. Maintenance staff drilled the hole in the wall in an attempt to find the source. This hole is level with the floor of a room behind the stairwell, which had some seepage, “but the real leak is coming from below the stair level,” says Wilson. An adjoining room along the foundation wall will require waterproofing to stop the leak from seeping through to the stairwell as well, he added. This repair work doesn’t solve the problem of finding the source of the pesky leak. Wilson says excavation will have to take place around the back of the building where the garbage bins are located. The School of Journalism’s broadcast technician Mark Pineo has been working at King’s since 2003 and is familiar with leaks in that area. The Radio Room moved to a new building nearby because the original broadcast studio, classroom and computer lab flooded four to five years ago. That original studio was located down the hallway from the Wardroom in the same hallway where the Kings Students’ Union recently lost all their storage materials due to flooding. 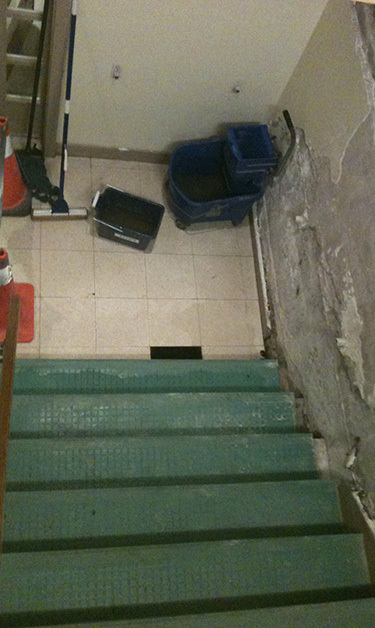 The hallway is located above the stairwell, which is currently pooling water. The water from the flood a few years ago turned out to be a burst sewer main that had erupted. Pineo says maintenance jack-hammered the concrete floor to find cast iron pipes had deteriorated. The wall in the stairwell that is currently experiencing flooding, Pineo says, has had lumps on it for four to five years. “At first it looked like it needed repainting but then it looked like growths on the wall,” Pineo says, adding that despite the appearance it could have been anything and he understands why maintenance staff haven’t pulled the wall apart before now. A former King’s student, Christina Macdonald, has been coming to the A&A Building for eight years. She says it hasn’t been an eye-sore until recently, but that peeling paint has been noticeable for the past two years. Wilson hopes the leak isn’t coming from the south end of the building because excavators would have to dig up the entire staircase leading down to the basement. Wilson says this would be incredibly labour-intensive.